When sixteen-year-old Maude runs away to Paris, her romantic dreams vanish as quickly as her savings. Increasingly desperate for money, she answers a mysterious advert: 'Young Women Wanted for Undemanding Work. Apply In Person To The Durandeau Agency.' But the work is very strange indeed. Maude discovers she is to be a repoussoir - an ugly young woman hired by Parisian socialites to enhance their beauty. 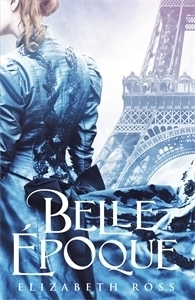 I thoroughly enjoyed Belle Époque. A fascinating read with a story that will have you hooked in a historical setting. Exactly what I wanted. Belle Époque is the story of Maude. Maude has run away to Paris after her father arranged a marriage for her with the local butcher who was twice her age. Not wanting to live a life not of her choosing she decides to make it on her own. She has an unfortunate start and starts to struggle for money. Desperate she applies for a job working for an agency who employs ugly women who accompany other women to events to make them appear more beautiful. While at first she hates the idea the lire of the money she could earn drags her in. I loved this book. I loved the historical setting more than anything else. Paris post revolution in its full glory. I loved seeing the differences between the differing social classes and the lives they led. I was fascinated by all the events Maude attends and the glitz and glamour of it all. Maude's job fascinated me and I loved seeing this whole new world through her eyes. The main part of the story focuses on Maude's fist big job working for a family where the daughter does not know Maude has been employed to work alongside her. I loved seeing how she tried to fit in and the questioned it raised as you went along about self worth and being the person you want to be rather than the person you are expected to be. The relationship between the two girls was utterly fascinating in that regard for me. The story has a romantic thread to it. I liked however that it wasn't the main focus of the story and an extra strand to the book. Sometimes I feel that part of a book can take over but it didn't in this case and I loved how it developed over the book. I loved what that thread of the story said about how subjective beauty is. All in all a fab read which I really enjoyed. This one sounds really interesting and I'm looking forward to reading it! This sounds interesting, and quite different, maybe I'll have to check it out sometime if I see it in a shop. Sounds interesting. Love a good historical fiction!